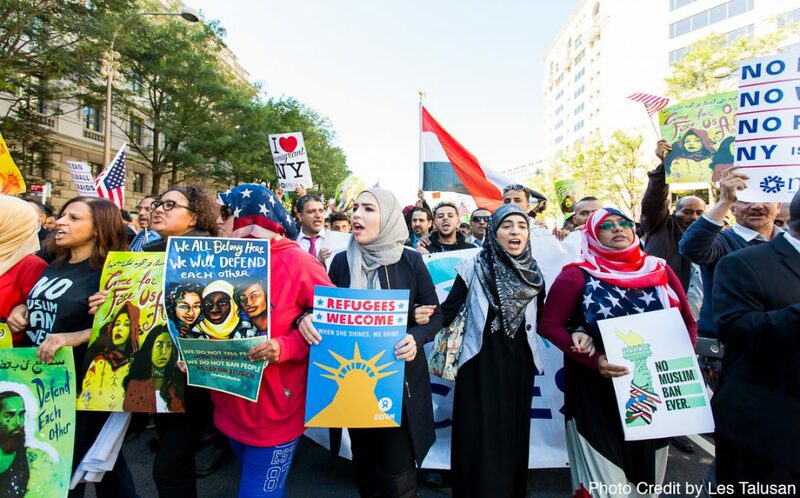 #NoBanNoWallNoRaids is an evolving online platform to provide information about breaking news, resources, and resistance efforts related to the policies of the Trump Administration that target and criminalize communities of color, immigrants and refugees. While this platform is anchored in the experiences of Muslim, Arab, South Asian, African and Black communities enduring the impact of state-sanctioned Islamophobia, we recognize that the issues and impact of criminalization policies are part of a systemic attack on the lives and worth of all people. On this site, you will find tools and information to become engaged in and to mobilize rapid response efforts, resources including community advisories and Know Your Rights, and a calendar of events focused on resistance efforts. We will be updating this site regularly, and we encourage you to contact us with any relevant information. This site is created with the support of the Security and Rights Collaborative at the Proteus Fund and managed by Laura Li, Deepa Iyer, Arjun Sethi and Linda Sarsour. We encourage you to also visit unitedagainstmuslimban.org to find information about ally activities and the community and advocacy groups to support.